Quite different to popular Chinese-style sweet and sour pork, this Thai take on sweet and sour is a quick and easy stir fry that will have people coming back for second helpings. Although the ingredients call for fresh pineapple, you can sweeten the dish with tinned fruit, or by increasing the quantity of sugar called for. You could also substitute palm sugar for brown granulated sugar. 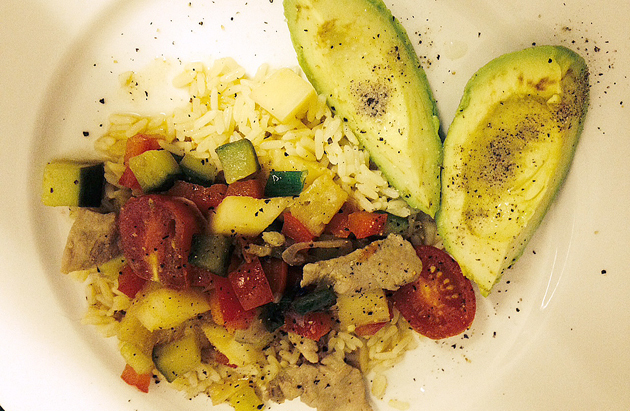 Serve with rice and slices of avocado pear with lemon juice and freshly ground black pepper, or with a simple green salad. Serves four hungry people. Heat the oil in a wok and add garlic. Fry until golden before adding the onion. After about five minutes add the pork. Stir fry until almost done and then add the fish sauce, sugar and freshly ground black pepper. 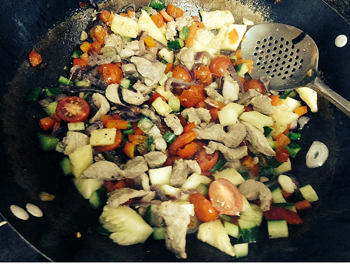 When the pork is cooked through, add the red pepper, cucumber, tomatoes, pineapple and spring onions. Stir fry for another four or five minutes. Meanwhile cook the rice and prepare the salad and garnish. Taste and adjust the seasoning if necessary. Serve. Alternative option You can also serve Thai-style sweet and sour pork with noodles. Cook the noodles, or soak in boiling water (depending on the type you are using) and then stir in with the other ingredients. Having grown up in a home where my British-South African grandmother was queen of the kitchen, meatballs were just an ordinary dish – tasty, but ordinary. And they weren’t on the menu very often. I don’t cook them often either, unless they are part of a themed dish of some sort, in this instance Thai, largely because they do take more effort than other dishes that can be equally delicious. I was introduced to these meatballs by a friend who visited Thailand several years ago and attended a basic cooking course. Preparation is surprisingly simple, though rolling the balls is undoubtedly time consuming. Fluffy jasmine coconut rice and a flavorful peanut sauce add a dimension that my gran’s homemade meatballs could never begin to touch. I wash my hands thoroughly and then use my fists and fingers to ensure that the mix is properly blended, but still has texture. Roll and shape the meat into fairly small balls. This quantity of meat should produce about 30 meatballs. You can make them smaller if you wish, in which case you’ll produce a larger quantity. Put them on a plate and pop into the refrigerator while you make the peanut sauce. Like hamburgers (or beef burgers), cooling them effectively stops them from falling apart when you cook them. 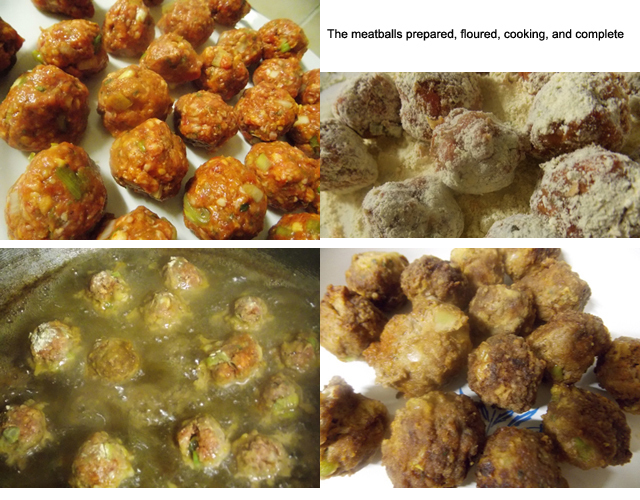 Once the sauce is on its way, shake a little rice flour over the meatballs and then fry them in oil until brown. Don’t be tempted to use wheat flour; if you don’t have or can’t find rice flour, there are other options. Apart from its dubious dietary value, wheat flour won’t do the meatballs any justice. I’ve successfully used chana dal flour (made from chickpeas), but explore your options. If you’re on a no-carb diet, just fry the balls without using flour of any kind. Then there’s the issue of oil. I confess that I cooked these in sunflower oil, even though I’m trying to avoid it. I’m sure that coconut oil would be better, as would light-frying the meatballs, rather than deep-frying them. However you decide to fry them, do so in batches and remove to absorbent paper towel or newspaper to drain thoroughly. A relatively rich rice dish, as rice goes, made with coconut milk and garnished with shredded coconut, Coconut Rice is deliciously different. Put the water, coconut milk, salt and sugar in a pot with the rice. Cover and bring to the boil. 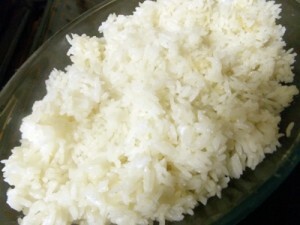 Reduce heat to low and allow to simmer for about 20 minutes until the rice is soft and cooked. Turn off the heat and allow it to rest on the stove for a further five to ten minutes. Fluff up with chopsticks or fork before serving. This must rank as one of the easiest, yummiest sauces I have ever mastered. 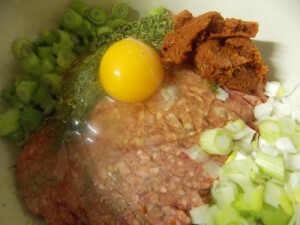 It is also a sauce that can be teamed up with many other basic meat dishes. You can make the sauce early on and then let it simmer quietly on the side while you prepare, make and cook the meatballs and coconut rice. It really is quick and easy. Just one word of advice; while peanut butter is a relatively unprocessed food, it is not made equal. Avoid peanut butter with added sugar and trans fats, and ideally only buy organic products. 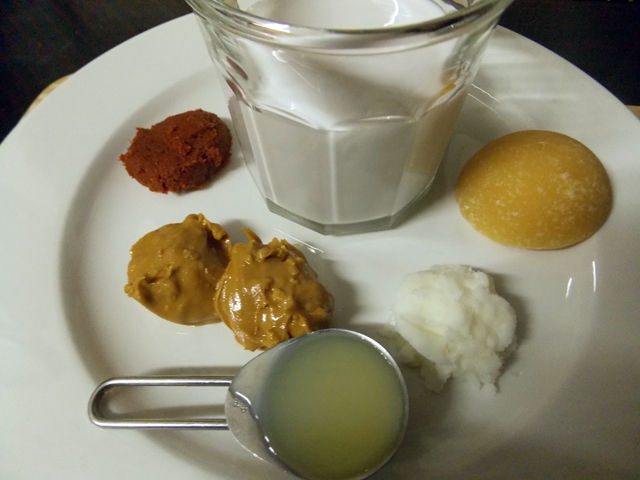 Add the peanut butter, palm sugar, lemon juice and coconut milk to the curry paste and bring to the boil. Lower the heat and allow to simmer gently until the sauce thickens. 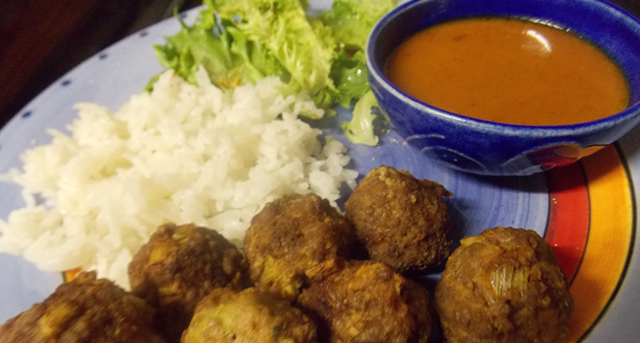 Serve separately in small bowls or poured over the rice and meatballs.